Canadian official to Americans: You think we're a threat? The weekend brought no evidence that the world is stepping back from a damaging trade war. Disputes between the United States and its biggest trading partners continued to heat up. The US decision to impose steel and aluminum tariffs on several of its allies came under fire at a meeting of G7 finance ministers; trade talks between Washington and Beijing failed to yield a breakthrough; and President Donald Trump kept up his fighting talk on Twitter. Here's where things stand. The world's two largest economies remain on collision course after US Commerce Secretary Wilbur Ross emerged from two days of trade talks in Beijing with little to show. No new agreements were announced, and China warned that it would ditch a previous pledge to buy more American goods if the Trump administration goes ahead with its plan to impose tariffs on $50 billion of Chinese exports later this month. A Chinese government statement said the talks in Beijing "produced positive and concrete developments" but it didn't provide details. In a statement released early Monday, the White House said the talks focused on reducing the United States' trade deficit by selling more agricultural and energy products to China. US officials had also conveyed Trump's "clear goal for achieving a fair trading relationship with China," it added. The White House said last week the new tariffs targeting China's high-tech manufacturing industries will go into effect shortly after June 15. Beijing has said it will respond with tariffs on a range of American goods, including cars, aircraft and soybeans. "Despite the strong incentives to avoid a trade war with the [United States], China cannot tolerate the perception that it has yielded to US demands," analysts at investment bank Nomura said in a research note Monday. There was no news from the Beijing talks about the fate of ZTE (ZTCOF), the Chinese tech company that has been crippled by a US government ban on buying American parts. Chinese officials have linked the company's punishment to the trade talks. Trump said last month that he was working with Chinese President Xi Jinping to give ZTE "a way to get back into business, fast." But that unleashed a backlash in Washington, leaving the company's future in limbo. The United States upset some of its closest allies at the end of last week by imposing tariffs on steel and aluminum imports from Canada, Mexico and the European Union. All three have plan to retaliate with their own tariffs on US goods, stoking fears of an escalating conflict. Their criticism continued over the weekend. During a meeting at a Canadian ski resort, top officials from six of the world's largest economies -- Canada, France, Germany, Italy, Japan and the United Kingdom -- took the rare step of asking US Treasury Secretary Steven Mnuchin to convey their "unanimous concern and disappointment" to Trump about the metal tariffs decision. Trump is set to meet the leaders of the six countries in person at a G7 summit later this week. But he showed no sign he plans to change his confrontational approach to trade policy. "When you're almost 800 Billion Dollars a year down on Trade, you can't lose a Trade War!" he tweeted Saturday. "The U.S. has been ripped off by other countries for years on Trade, time to get smart!" When you're almost 800 Billion Dollars a year down on Trade, you can't lose a Trade War! The U.S. has been ripped off by other countries for years on Trade, time to get smart! 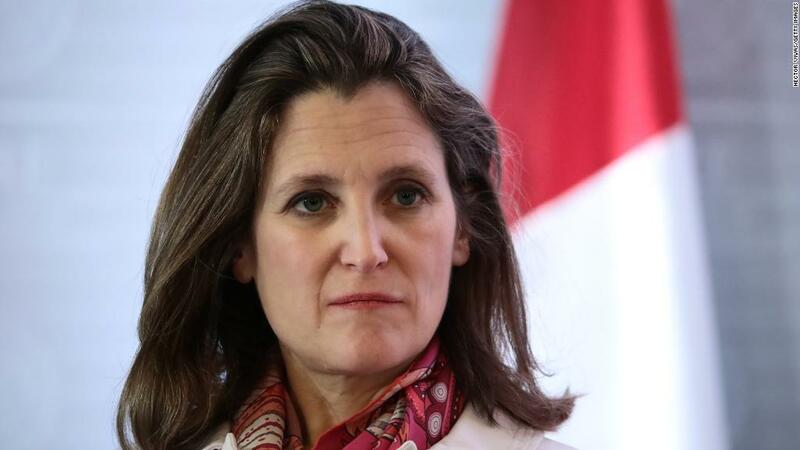 On Sunday, Canadian Foreign Minister Chrystia Freeland urged Trump to "think hard about the message you're sending to your closest allies." "We are hurt and we're insulted," she said on CNN's "State of the Union." Trump showed no sign of easing up on his neighbors, or China, on Monday. "Farmers have not been doing well for 15 years. Mexico, Canada, China and others have treated them unfairly. By the time I finish trade talks, that will change," he tweeted.